The Panasonic Compact HD/SD Live Switcher AW-HS50N offers 10-bit processing, four HD/SD-SDI inputs and one HD DVI-D input, as well as a built-in MultiViewer, Chroma Keyer, Aux Bus, 1080/29.94PsF support and more. Ideal for mobile production, AV facilities, event video and more, the half-rack width Panasonic Compact HD/SD Live Switcher built-in MultiViewer allows users to view four, nine, or 10 images on a single display – significantly reducing size and weight of a complete HD production system. The adjustable MultiViewer outputs can also be used to provide a multi-image large-screen presentation display. Other advanced functions include dedicated hardware for picture-in-picture (PinP) with dissolve transitions, switchable upconversion, color correction, a chroma/linear keyer plus a downstream keyer (DSK), auto or manual video transitions, wipe and PinP preset memories and frame memories. As a key component in Panasonic’s first complete Internet Protocol (IP) production system, the HS50 also offers an IP link to the new AW-RP50 remote camera controller. This link enables remote switching of the remote controlled camera video on the HS50’s AUX bus and other unique functions The AW-HS50 has built-in, switchable 10-bit frame synchronizers on each input, ensuring reliable, glitch-free switching even with non-synchronous sources such as remote camera feeds, small camcorders and computer graphics. The HS50 has four HD/SD-SDI inputs and one HD DVI-D input, two HD/SD-SDI outputs and one scalable DVI-D output. Additional standard features include an on-screen display (OSD) for viewing switcher settings, GPI input, camera tally outputs, an Ethernet control interface, 4-pin XLR 12VDC input and an AUX Bus for a versatile production workflow. 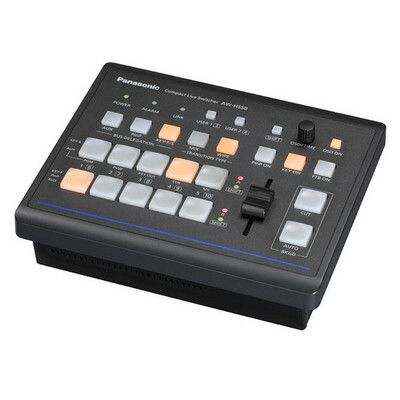 Rent the Panasonic Compact HD/SD Live Switcher from DeckHand Camera Rentals Today!